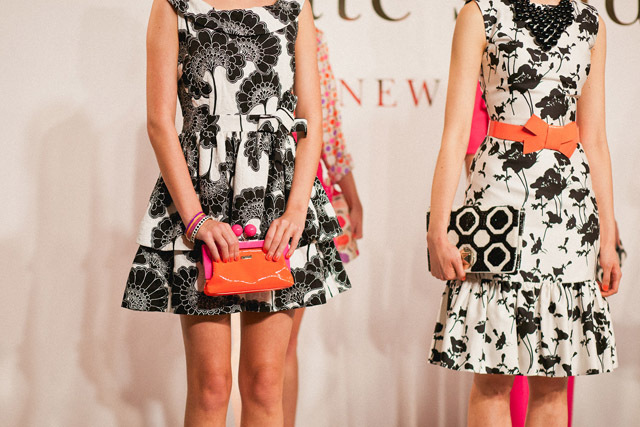 Here's a fun sneak peek of the Kate Spade Spring 2012 presentation yesterday. How adorable is that first bag?! The rest of our photos will go live on Glitter Guide tomorrow. the "eat cake for breakfast" is true happiness! That first tote is SO fun. I love it! Stunning shots.. Kate Spade's designs never fail to make me smile! 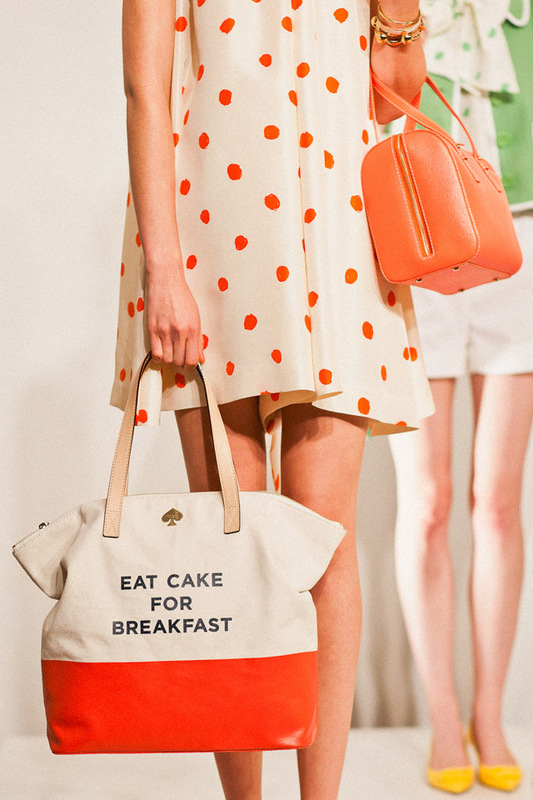 "eat cake for breakfast" may be the best line on a bag ever. I really love the first picture with the 2 bags!!! The orange one with the long zip it's fantastic!! Oh Kate, She's done it again!!! So much cuteness. The shapes. The colors. The bows. Darling, colorful and girlie looks...I've always enjoyed Kate Spade's classic cuts and styles! just one question how old are you because im 30 and im in a style rut???? So precious!! Gotta love Kate Spade. I love Kate Spade and this is no exception! So pretty and girly, keep up the good work on glitter guide Taylor! Love the bright, girly prints! god i love kate. i hadn't seen the collection yet - thanks for sharing! I had no idea that these were GG's photos! They are all over the blogosphere (and rightly so). Fantastic! Wow how fantastic! Great pieces here!! WHOA I love the colors! Fabulous! And I would love to have the bag in that first picture. I did love the first bag and I loved everything I saw, wow! what a great collection so far! I don't usually pay attention to pics of designer stuff but the colors caught my eye right away. These clothes are happy clothes and I don't think someone wearing them could help feeling good. I love the eat cake for breakfast tote! Soo excited for this season, love that tote!! the orange pokla dot dress is adorable!!!!!! I love Kate Spade ecpesially accessories! They are so colorful and recognizable! Love the ensembles, especially the first pic. Want the tote!